“Many say receiving a transfusion is not like eating blood. Is this view sound? Present day reasoning remains essentially the same: a blood transfusion is eating through veins. If you have been a Witness for any period of time, you have heard this analogy many times. Is it a fair one? Not really, because alcohol and blood are very different fluids. Alcohol is already in a form that can be utilized by the bodies cells and absorbed as a food or nutrient. Blood, on the other hand, is completely different. Once transfused, it is not digested or utilized as a food. It remains the same fluid tissue with the same form and function. For blood to be utilized as food, it would first have to be literally eaten and then pass through the digestive tract. That these are the facts can be readily seen from simply considering why it is that a doctor would prescribe a blood transfusion. Would he do it because a patient is malnourished and needs a good meal? Of course not. He orders the transfusion because the patient lacks the ability to transport oxygen to his cells in sufficient quantity. On this argument rests the entire blood prohibition. Is the argument valid? Definitely not! Consider the case where two patients are admitted to a hospital because they are not able to eat and thus sustain themselves. One patient is given a blood transfusion, whereas the other is given I.V. Dextrose or the equivalent. Which one will live? Obviously, it is the one given I.V. Dextrose which can actually be used by the body as food. The patient given the blood transfusion will die because blood is not food, but simply the vehicle used to transport it. The simple fact is that a blood transfusion is an organ transplant, not nutrition. When they finally caught up with the previous sixty years of scientific knowledge, in the mid 1960’s, and they came to appreciate that blood transfusions are not a “feeding on blood,” they were faced with a dilemma. For the last few decades, the society has tried to get around this problem by referring to blood transfusions, not as eating blood, but as a sustaining of one’s life my means of blood. This is an unwarranted insertion of a concept that is not scriptural as we have already seen. Ironically, the blood components that the society does allow are taken precisely to sustain ones life. Why, then, did they keep the ban on blood transfusions? It is a simple fact that the Society will be hard pressed to lift this prohibition and admit that it has been a tragic misunderstanding from the start. So much literal blood has been spilled, so many young and old victims have been hailed as heroes, and the brothers and sisters have gone through so much pain, court cases, fears and losses that there would be an unprecedented outcry among Jehovah’s Witnesses and outsiders if it were suddenly lifted, and yet that is what must happen. “‘artificial blood’: w85 4/15 21; w83 11/1 23; w82 5/1 7; g82 6/22 26; g81 6/22 29-30; g80 2/22 21-3; g80 8/8 29-30; w79 11/15 29; g79 8/8 31; g79 10/8 29; g78 2/8 29; g74 6/22 22; g73 7/8 31; g72 6/22 29-30; g70 1/22 30; g70 2/8 30” [w is the literature code for The Watchtower magazine; g is the code for the Awake! magazine]. The 2013 Watchtower Library indexes a staggering 216 occurrences. This is only a small sample of the WTS articles dedicated to “blood substitutes.” It is a fact that the Society uses enormous resources to find alternatives to blood transfusions to minimize casualties. Even more, the fact that suitable replacements for blood transfusions have not been forthcoming as the Society had hoped have caused it to slowly abandon its position on blood, but in a way that many had not become aware of until AJWRB began publishing and advocating for change back in 1998. We believe it is accurate to say that the Watchtower Society no longer really believes that blood transfusions are wrong. The work done to minimize casualties by permitting all blood fractions is a step in the right direction but the policy continues to cost many lives and much suffering – and for what purpose? Primarily to maintain the organizational image and prestige of the governing body. While the Society is waiting for medical science to save it from this deadly dilemma, it has demonstrated its lack of faith in its own doctrines by compromising on the principles it claims to uphold. Why should you or your children die for something their actions demonstrate they don’t even believe in? Very interesting. My own feeling is that the GB will never have the courage to admit they were wrong. They have got themselves out on a limb; there is no return. Whatever we or you can say, wheather blood transfusion is a nutrition or transplant, we agree that Jehovah God,the Creator of the blood, He knows what is best for us. We agree that if He told us to obstain from the blood, He had a good reason to say that, even if the reason had not came open to the doctors today. Onother issue is that God is the High Inteligent. So He knows even what will be discovered by doctor in 1000 years to come. If you areca honest person, you need to admit that what the science claim to be true, tomorrow may be proofed false. So medicine discoveres should not be said trustfull as tomorrow may be claimed a big erro. We can agree that the writer of the book of Acts wrote to “abstain from blood”. However, to assume that this comment has anything to do with the modern practice of blood transfusion requires a huge intellectual leap that the context does not support. You can find a discussion of these issues here: http://ajwrb.org/bible We feel that you will likely reach a similar conclusion after you carefully study the scriptures and context outside of what the Watchtower has published to support its nonsensical policy. Is that an attempt at trying to minimize the damage the WTS has caused through this lunatic doctrine? By claiming that “Jehovah God knows what is best for us”? Well clearly the Governing Body members don’t, or if they do, they simply ignore it since they know full well they’d be slapped with numerous lawsuits by family members who had to bury husbands, wives, siblings, parents or children due to the ban on blood transfusions over the years. And if YOU are an honest person, you need to admit that what the Governing Body claims to be true today, tomorrow may be proved false. I am still waiting for your response to my detailed e-mail, but I think you guys miss critical points when you argue that blood transfusions are not meals! This argument is besides the point and completely irrelevant when we consider the reason the creator provided for prohibiting eating blood: namely that “the life or soul of every flesh is in its blood” (Leviticus 17:11a & 14). When you eat food or drink some liquid at least some processed components (through our digestive system) of whatever you eat end up in our blood, don’t they (this is the main point)? if blood or any of its components is transfused it also ends up in our blood, does it? If eating blood results in some components of foreign blood coming in contact with our blood, and transfusion also results in some components of foreign blood coming in contact with our blood, then the results are the same especially when the reason the creator provided for prohibiting blood is considered!!!!! The creator simply does not want any two lives to be mixed up!! !end of story! Do not promote such mixing of lives or souls. Jehovah takes exception to that. I think the WTS focused too much on the spiritual significance of blood and did not convey this key reason why the creator does not want blood to be eaten or transfused!!!! And that is why you attack the WTS. Scientific finding: “Litter-mate pups maintained for 99 days on intravenous plasma as the only source of protein, achieve a gain in height and weight equal to, if not exceeding, that of their litter fellows receiving the same quantity of horsemeat and liver by mouth.”— Allen JG, Stemmer E, Head LR: Similar growth rates of litter mate puppies maintained on oral protein with those on the same quantity of protein as daily intravenous plasma for 99 days as only protein source. Ann Surg 144:349Ã‚Â–354, 1956. Also a person starving for the nutrient iron can often times stave off dying from that starvation by getting a transfusion of blood or red blood cells. Noah was told that meat could serve as food but blood could not. The scientific fact is that intravenous blood will provide nutrients thus food. Just because it may not provide as much nutrition as glucose infusions does not mean it provides no nutrition, The claim that transfused blood does not provide nutrition is bogus. Looks like intravenous blood really can be used to feed nutrients to a creature. Blood proteins like albumin and hemoglobin have the potential to serve as food in the body when transfused. It bears noting they are not generally used this way, although there have been some situations where albumin has been occasionally used in this manner. Your argument in this regard becomes unsupportable when you consider that Watchtower policy has permitted the use of albumin for decades, and hemoglobin since 2001. Additionally, iron is a mineral, it is not food. You can have an iron deficiency and be in need of iron, but it does not function as food or fuel to power the cells in your body. 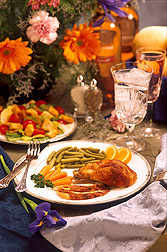 Only carbohydrate, fat and protein can be categorized as food. While the question is meant to prejudice the reader and make it appear that the WT publishers are just plain ignorant of scientific facts, the actual answer to the question is a resounding yes. Why? Because a meal supplies a body with nutrient/nourishment/nutriment/food and this is exactly what a blood transfusion does thus acting as a “meal” acts and in some cases providing many more nutrients than one meal. A food truck driving down the street can be filled with food to deliver to the grocery store. This does not make the truck food. The truck is transporting food. It is similar with blood, it is a vehicle for delivering food (carbohydrate, protein and fat), water, oxygen, minerals, vitamins, enzymes, etc. Physicians do not prescribe a blood transfusion to treat malnutrition. Indeed, if they did the patient would die because no meaningful nutrition would be conferred. Instead, physicians prescribe blood to replace something your body has lost or is missing. Watchtower policy approves the use of many of these various transfusions, but denies others with no clear Biblical basis. Could a person “sustain” his life with blood providing nutrition? The answer is yes, but it would required eating and digesting the blood, to break it down into a format that can be absorbed by the intestines. So as you see, transfusing/transplanting blood/kidneys is like eating blood/kidneys by mouth in several ways but NOT in the method of administration. And it is the literal eating by mouth of human kidneys that is a dfing offense not because it may provide nutrients/nourishment or is taken in to the body or the bible says to abstain from kidneys but rather because it is illegal, criminal, often spiritistic, and abhorrent to civilized men. On the other hand, the bible does say abstain from blood thus there is no inconsistency on our part. There is only false equivocation on the part of opposers. Analogies and illustrations are tools that can be helpful in understanding or visualizing abstract or complex subject matters. They have their limitations, and can take a person on a detour to side issues, away from the primary purpose or subject they are intended to simplify. The purpose of this analogy was simply to illustrate that since a blood transfusion is in fact an organ transplant, the blood ban made more sense between 1967-1980. It accomplishes that limited purpose. None of this, however, alters the fact that the requirement for first century Gentiles to “abstain from blood”, can not logically be extended to transfusion in our view. This is the same position taken by both Orthodox Jews who are infinitely familiar with the Torah/Mosaic Law; as well as every major Biblical scholar. To point out these facts does not make one an “opposer” in the Scriptural sense. If you find the Watchtower’s evolving blood policy compelling, and wish to believe and follow it, you should by all means do so.